Anyone who has made a film before knows just how challenging and important the post-production process can be. While a looming festival submission deadline can serve as a great motivator in getting your film finished by a specific date, we decided from the very beginning that we would not take any post-production shortcuts. Luckily for us, we had a great team on board, and no major time constraints to get the film finished for the major festival deadlines. We want as many people to see RSVP as possible – and now that it’s finished – this means getting it out to the film festivals. And not just the most well-known festivals. Our strategy from Day One has been to get RSVP in front of crowds who will be moved and challenged by the message this film imparts. So, in addition to the major film festivals, we are seeking out festivals in communities that we believe can stand to benefit from the themes RSVP presents. In addition to LGBT communities – and probably even moreso – this includes communities that have been silenced by powerful religious movements. As the film’s tagline says, this is “A Different Kind of Coming Out Story”. RSVP’s writer/director, Shannon Beeby, is from the South (Pensacola, FL), which is where a lot of the films inspiration is drawn from. In fact, we intended to shoot RSVP on the beaches of Pensacola. But alas, being that our filmmaking community is based in New York City, we opted for the beaches of East Hampton. All of this backstory is necessary, because when Mrs. Beeby happened upon a relatively new LGBT-themed film festival based in her hometown of Pensacola – the STAMPED film festival – she couldn’t imagine a better place to have the film premiere. And despite RSVP still in its unfinished post-production stage and having already missed the late deadline for the festival, we submitted it anyway, along with a note that promised all unfinished post (mainly color and FX) would be completed in time for the festival if they chose to let it in. 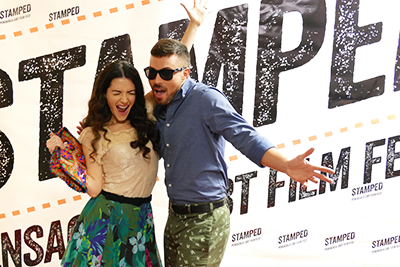 And despite having already programmed opening night of the festival, the STAMPED board members held a vote and added a spot for RSVP on opening night. 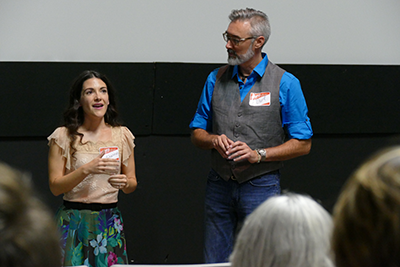 Two of STAMPED’s board members, David Newton and Public Radio Content Producer, Lindsay Rae Myers (who interviewed Mrs. Beeby…a sound clip of which can be heard here) were instrumental in making STAMPED a huge success and a memorable experience that Bee Nest Films will always cherish. 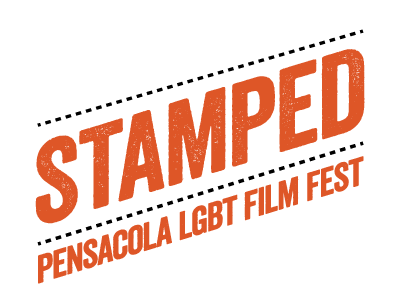 STAMPED: Pensacola LGBT Film Fest — was inspired by efforts of the LGBT community in the mid-1990s to highlight the impact of LGBT tourism. After certain local officials and business owners spoke out against gay and lesbian visitors, including annual Memorial Day weekend activities, which draw tens of thousands of people to the area, many LGBT residents and visitors began to stamp the cash they spent with the words “GAY MONEY” and/or a pink triangle. That year, Christopher Street South, a local LGBT publication, estimated that gay and lesbian tourists spent $25 million annually in the area. The mission of the Pensacola LGBT Film Festival is to host an inclusive, entertaining event that not only serves to bring our local LGBT community together for four nights of fun, but also educates others in a way to spread acceptance and love throughout the Gulf Coast.